1629 - 1676 (46 years) Has more than 100 ancestors and more than 100 descendants in this family tree. 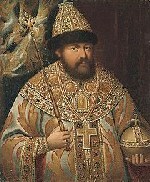 Alexei acceded to the throne at the age of sixteen after his father's death on 12 July 1645. He was committed to the care of the boyar Boris Morozov , a shrewd and sensible guardian sufficiently enlightened to recognize the needs of his country, and by no means inaccessible to Western ideas. Morozov's foreign policy was pacificatory. He secured a truce with Poland and carefully avoided complications with the Ottoman Empire . His domestic policy was scrupulously fair and aimed at relieving the public burdens by limiting the privileges of foreign traders and abolishing a great many useless and expensive court offices. On 17 January 1648 Morozov procured the marriage of the tsar with Maria Miloslavskaya , himself marrying her sister, Anna, ten days later, both daughters of Ilya Danilovich Miloslavsky (1594 - 1668). Morozov was very unpopular however, regarded as a typical self-seeking 17th-century boyar, and was generally detested and accused of sorcery and witchcraft . 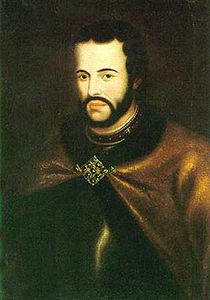 In May 1648 the people of Moscow rose against them in the so-called Salt Riot , and the young Tsar was compelled to dismiss them and exile Boris to the Kirillo-Belozersky Monastery . Suffering from the forced separation, Alexei sent many tender letters to his mentor, and urged the guards to treat him as civilly as possible. The successful issue of the Moscow riots was the occasion of disquieting disturbances all over the tsardom culminating in dangerous rebellions at Pskov and Great Novgorod , with which the government was so unable to cope that they surrendered, practically granting the malcontents their own terms. 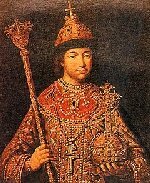 One man only had displayed equal tact and courage at Great Novgorod, the metropolitan Nikon , who in consequence became in 1651 the Tsar's chief minister. 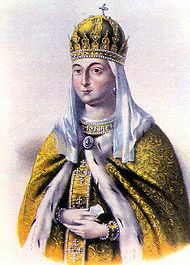 In 1653 the weakness and disorder of Poland, which had just emerged from the Khmelnytsky Uprising , encouraged Alexei to attempt to annex from her rival the old Rus' lands. On 1 October 1653 a national assembly met at Moscow to sanction the war and find the means of carrying it out, and in April 1654 the army was blessed by Nikon (now patriarch). The campaign of 1654 was an uninterrupted triumph, and scores of towns, including the important fortress of Smolensk , fell into the hands of the Russians. It was also during this war that Ukrainian Hetman Bogdan Khmelnitsky appealed to Tsar Alexei for protection from the Poles, and got it in the form of the Treaty of Pereyaslav which brought about Russian dominance of the Cossack Hetmanate in Left-Bank Ukraine . In January 1655 the rout of Akhmatov arrested their progress; but in the summer of the same year, the sudden invasion by Charles X of Sweden for the moment swept the Polish state out of existence; the Russians, unopposed, quickly appropriated nearly everything which was not already occupied by the Swedes, and when at last the Poles offered to negotiate, the whole grand-duchy of Lithuania was the least of the demands of Alexei. Fortunately for Poland, the Tsar and the king of Sweden now quarrelled over the apportionment of the spoils, and at the end of May 1656 Alexei, encouraged by the Habsburg emperor and the other enemies of Sweden, declared war . Great things were expected of the Swedish war, but nothing came of it. Dorpat was taken, but countless multitudes were lost in vain before Riga . 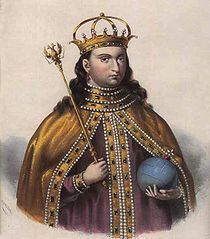 In the meantime Poland had so far recovered herself as to become a much more dangerous foe than Sweden, and, as it was impossible to wage war with both simultaneously, the Tsar resolved to rid himself of the Swedes first. This he did by the Peace of Kardis ( 2 July 1661), whereby Russia retroceded all her conquests. The Polish war dragged on for six years longer and was then concluded by a truce, nominally for thirteen years, which proved the most durable of treaties. By the Treaty of Andrusovo ( 11 February 1667) Vitebsk , Polotsk and Polish Livonia were restored to Poland, but the infinitely more important Smolensk and Kiev remained in the hands of Russia together with the whole eastern bank of the Dnieper River. 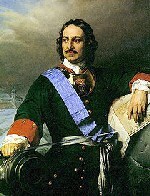 This truce was the achievement of Afanasy Ordin-Nashchokin , the first Russian chancellor and diplomat in the modern sense, who after the disgrace of Nikon became the Tsar's first minister till 1670, when he was superseded by the equally able Artamon Matveyev , whose beneficent influence prevailed to the end of Alexei's reign. When Charles I of England was beheaded by the Parliamentarians under Oliver Cromwell in 1649, an outraged Alexei broke off diplomatic relations with England and accepted Royalist refugees in Moscow. He also banned all English merchants from his country and provided financial assistance to "the disconsolate widow of that glorious martyr, King Charles I." It is the crowning merit of the Tsar Alexei that he discovered so many great men (like Fyodor Rtishchev , Ordin, Matveyev, the best of Peter's precursors) and suitably employed them. He was not a man of superior strength of character, or he would never have submitted to the dictation of Nikon. But, on the other hand, he was naturally, if timorously, progressive, or he would never have encouraged the great reforming boyar Matveyev. His last years, notwithstanding the terrible rebellion of Stenka Razin , were deservedly tranquil.